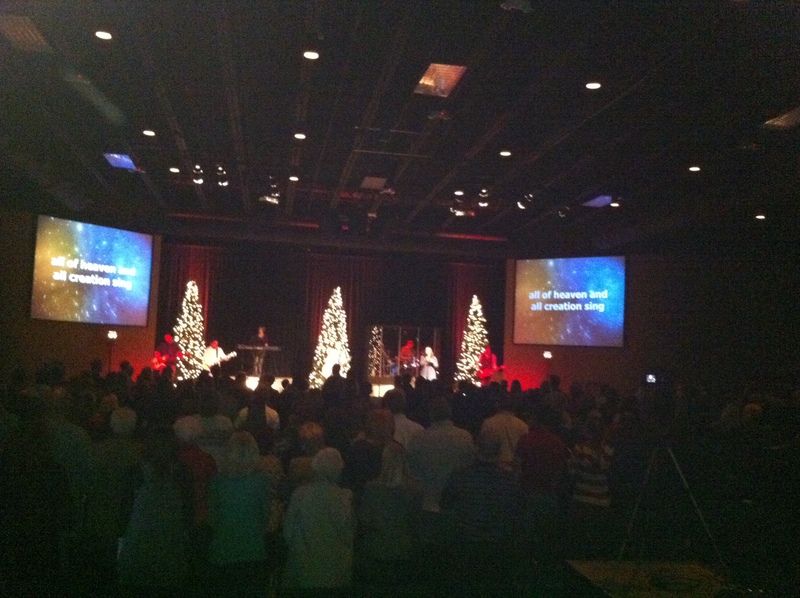 Christmas Eve at Graystone was one of the best days in the history of our church. 1st Spanish Service…Approx. 80 people, the majority road buses from Gwinnett Estates, gathered in the newly renovated Front Room for a Christmas Eve Service in Spanish. It was a full-blown service with a bulletin, communication card, worship band, children’s song, and sermon…all in Spanish. Luis Valenzuela did an AMAZING job preaching the gospel and 9 people indicated that they accepted Jesus Christ! Over 1500 in attendance…Christmas Eve was the 2nd largest crowd in the history of Graystone Church with over 1500 in attendance. The only service larger was our Grand Opening on 01.10.10. God continues give us favor and grow our church. All the Families…one of the reasons that there were so many people at Graystone is that many of you brought your families. I loved seeing all the families at Graystone worshipping God together. It is part of God’s plan the reach the world through OIKOS (households or families). There really is no better family Christmas tradition that worshipping God together as a family on Christmas Eve, especially when it is your home church. Christmas Music…”Kyle and the Band” along with JP and Shannon from Echoing Angels played some AMAZING Christmas music. Kelsi got sick, and Jennifer did an incredible job filling in at the last minute as our female vocalist. “Silent Night” was beautiful with Candace on the keys and Jennifer singing. Also, I loved singing the classic Christmas songs. Graystone TV video…Melinda, who is a natural BTW, did a great job with the Graystone TV welcome video. We wanted to do something special for our guests to communciate some of the things going on at Graystone Church. A White Christmas…Heath’s dream came true. How could it NOT snow on Christmas Day after Heath’s beautiful rendition of “A White Christmas”? I do not see this becoming an annual Christmas Eve tradition. Just sayin. The Fire Illustration…The main focus of my message was to reach out to those who have gotten out of fellowship with God and other Christians, the church. Our hope and prayer is that God would use Christmas Eve and the beginning of the New Year to get them back into “The Light” and back on fire for God. And hopefully, Graystone Church will burn larger and brighter for God in 2011. A City on a Hill cannot be hidden. A Candlelight Service…by far, my favorite part of the service was lighting the candles. I loved seeing the auditorium filled with “God’s light” as Ryan Brooks belted out “O Holy Night”. God has blessed Ryan with an AMAZING voice, and it was the perfect finale to our Christmas Eve Service. It truly was one of the most powerful moments of 2010. And God blessed us with many. Again, I want to say a big THANK YOU to EVERYONE who served on Christmas Eve at Graystone. The Parking Team, Greeters, Coffee Bar Servers, Children’s Workers, Tech Team, Ushers, Band (8 songs BTW), Admin Team, Decorators, etc. EVERYONE did an AMAZING job to pull off 3 services back to back to back as well as a simultaneous service in Spanish at 2PM on one of the busiest days of the year. God is good! He has blessed Graystone more than words can express. I cannot wait to see what He does in 2011. The best is yet to come! The Christmas Eve service was wonderful — the lighting of the candles (God’s light) was awesome and I hope will be a part of our Christmas Eve services from now on. Yes everone did an amazing job, the volunteers just did what needed to be done for the good of God and Graystone. I enjoyed the 2:00 service with my most of my family and grandkids — great! I also wanted to say a big thank you to everyone involved in the Children’s Christmas Program — it gets better every year! A very big thank you to everyone who had a hand in making it happen, I for one appreciated all you did and enjoyed it even though I didn’t have any children participating in the program. God’s good blessings to all for 2011. Thank you for the message at the Christmas eve service. My stepson was with us (he lives in Ohio). He was really touched by your message and felt God speaking to his heart with your words. We really hope he will use this to get his life back on track. Happy New Year to everyone! It is going to be a great 2011!!! Great to hear Koren. I will be praying for your stepson.